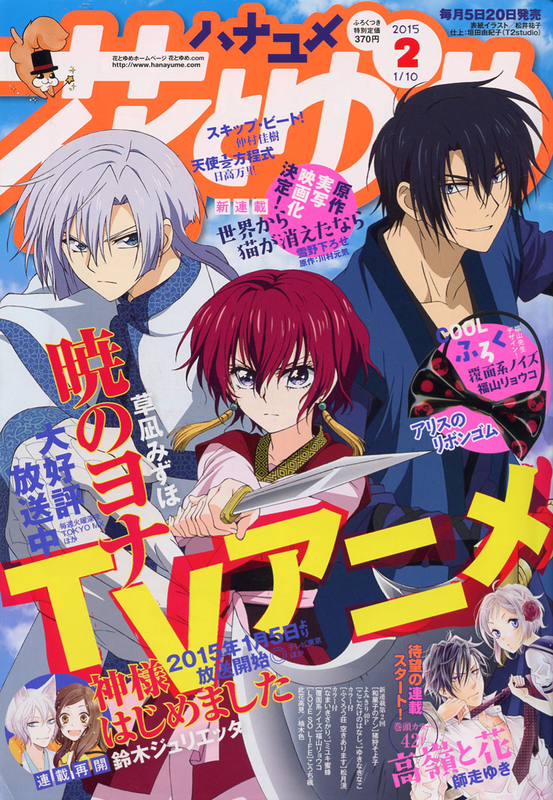 “Akatsuki no Yona’ is on the cover of this issue. The furoku is an Alice rubber ponytail holder. It’s very stiff, so I’m not sure how useable it is. Here are the color frontis pages from the issue. “Takane to Hana” is now a regular series and “Sekai kara Neko ga Kieta nara” has moved from Hana to Yume Online and is now a regular series in Hana to Yume magazine. The oneshot is another “Koko dake no Hanashi” story. I hope this becomes a series. Given the pattern of oneshot releases, it looks like it’s well on its way to becoming a series. 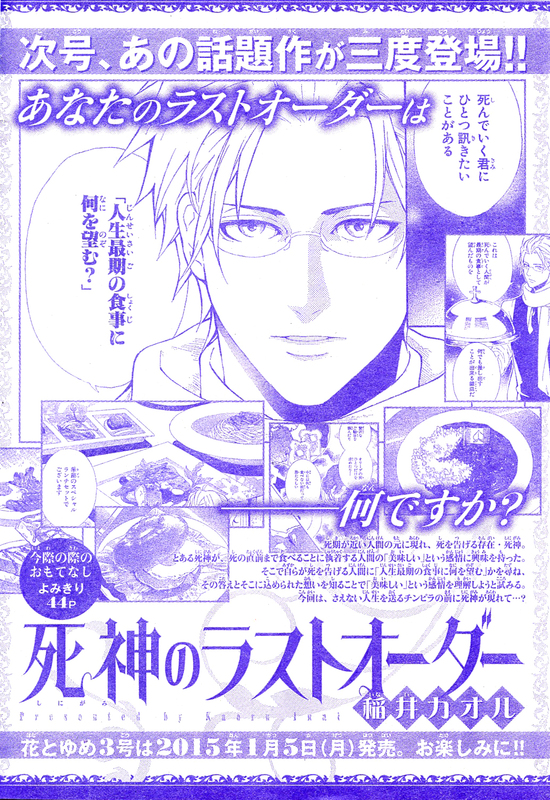 Here are the previews of Hana to Yume issue 3, which will be released on January 5th. “Shinigami no Last Order” is returning for a third time. I read one of the oneshots and it was quite good, but very bitter sweet. As implied by the name, the subject of the story dies at the end after eating their last meal. I’m looking forward to the next story. It would be nice if this became a regular episodic series in The Hana to Yume. The second season of the “Kamisama Hajimashita” anime begins on January 5th. Please look forward to issue 3! I’m just curious about Yami No Matsuei? Has it continued yet? I don’t follow that series, but I don’t recall seeing it recently. I think that mangaka is doing a different series now.